Built during the Kakatiya dynasty, Warangal Fort dates back to the 12th century. Warangal Fort, located in the newly-formed state of Telangana, is a classic example of the Kakatiya architecture. And although the fort is now in ruins, its architectural marvel can still be witnessed through its rustic remnants. The fort was built on the hillock Ekashila, by the King Ganapatideva, which was later completed by his daughter Rani Rudrama. The three-layered fortification is located on the south-east side of the Warangal city. Kakatiya Kala Thoranam is a group of four ornamental pillars of a gate, that has been made the emblem of Telangana after it got the status of an independent state. The Warangal Fort stands as a symbol of the Kakatiya rule in Warangal. 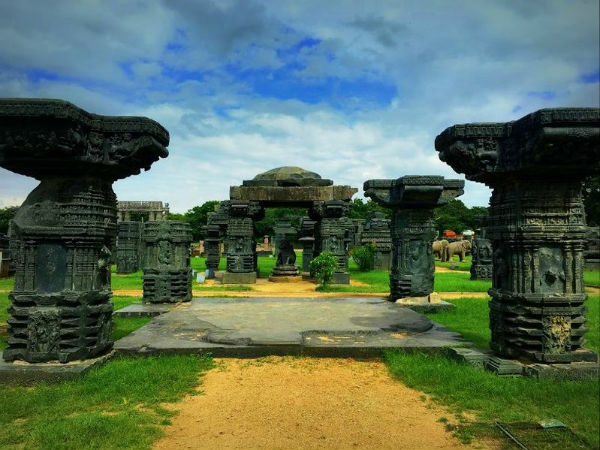 Formerly ruled by the Yadava dynasty, Warangal was taken over by the Kakatiyas in the 12th century. The capital of the Kakatiya Empire was moved from Hanamkonda to Warangal. It is believed that King Ganapatideva replaced an exisiting structure made of brick wall, to build the stone fort of Warangal. Apart from his daughter Rani Rudrama, her grandson Prataparudra II also made some additions to the fort. He was the last ruler of the Kakatiya dynasty, before it was taken over by the Sultans of Delhi. The three-tiered fort was built in the form of concentric circles. The first wall was built by Rani Rudrama, which was an earthern wall that was 2.4 km in diameter. A 150 ft wide moat was dug around this wall, that served as the fort's outer limits. The second wall was made of granite stone and measured 1.21 km in diameter. These stones were placed in a close-knit fashion without using any mortar, a reflection of the Kakatiya artisan's architectural splendour. The wall was initially built by King Ganapatideva, which was alter raised by Rani Rudrama. It is safeguarded by 45 rectangular shaped towers, and the inner part of the wall has 18 stone steps that takes you towards the fort. The final ring of wall was built using mud and at a diameter of 12.5 km, which comprises the Warangal city of today. The 30 ft high stone pillars which are known as Kakatiya Kala Thoranam, which literally translates to 'Gateway of Glory', is another architectural marvel that was carved out of a single rock. Swayambhudevi Alayam is a temple that is dedicated to Mother Earth and is located at the centre of the fort. Shambulingeshwara Temple, dedicated to Lord Shiva, and the Open Air Museum are the two other places that must be visited within the fort premise. Apart from these places, the fort consists of ruins of the Shiva Temple, ceiling panels, numerous tiny shrines, etc. The public hall, which goes by the name Kush Mahal, was built by the Sultans of Delhi after they captured Warangal. The rectangular shaped building has 6 archways on both ends. All of these come under the archaeological zone since the entire fort is under the care of Archaeological Survey of India. The fort will remain open on all days of the week from 10 am to 7 pm. Entry fee is Rs 15 per individual and Rs 200 for foreign nationals. An extra fee of Rs 25 might be charged for carrying a video camera.